The Turbo serie was launched simultaneously with the X1 serie. The X1 Turbo has enhanced graphic features. It also has additional hardware compared to the X1 serie: DMAC, CTC and SIO as standard. CTC & SIO can be however implemented on X1 serie through additional FM sound board or Mouse/Rs-232C board. But DMAC can not. 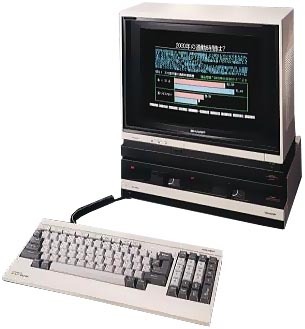 Turbo series has a special "KANJI" V-RAM, compared to X1 series which has only one way to display "KANJI" symbols, a heavy task for the Z80A: to display 1 "KANJI" character, 96 bytes of data are transfered to the V-RAM. As opposed, Turbo series just send 3 bytes of data (2 bytes for shift JIS code, and another 1 byte for attribute) to the "KANJI" V-RAM. Among the 8-bit systems, only the X1 Turbo serie and MZ-2500 have this special V-RAM. The access time is almost null, compared to the X1's V-RAM which is slower. In the same way, it takes from 2 to 8 seconds to define P.C.G (user generated characters, similar to sprites) with the X1 serie, while it takes only 0.5 seconds with the Turbo serie. The MZ-2500 is also equiped with this feature. see more Sharp X1 Turbo Ebay auctions !